13th September – Dublin Ladies Footballer and Brand Ambassador for Denis Mahony Motor Group Noelle Healy has featured in part two of the ‘Start Your Journey’ video series. 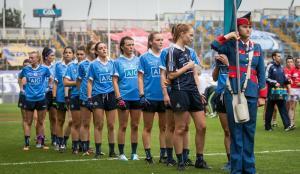 Ahead of Dublin’s bid for consecutive All-Ireland success, when they meet old rivals Cork this weekend in the 2018 decider, Noelle reflects on her experiences in the sky blue of Dublin and how previous heartbreak has shaped the current crop of players. The anaesthetist and 2017 Player of the Year also talks about the influence Sonia O’Sullivan had on her when she was growing up and how women’s sport in Ireland has never been healthier. Everybody in my generations’ sporting role model is probably Sonia O’Sullivan. Growing up we didn’t really appreciate how difficult what she was doing actually was. To be a middle-distance or long-distance athlete winning Europeans, Worlds and Olympic medals was just unbelievable and when I was doing laps around the place I used to pretend that I was Sonia O’Sullivan coming over the line. She was without a doubt one of the biggest idols I would have looked up to when I was younger. I was lucky enough to play on the under-14 team, from then on, I’ve played inter-county every single year. We won the under-14 All-Ireland final and I think nearly 13 of the girls that played in that match were playing in an All-Ireland minor final about six years later. So, we were a really close group and there’s still a good chunk of us playing together now. I think that’s what’s so special about sport, when you play with the same club and the same county, you forge really, really strong bonds and it’s almost like a sisterhood or a family that you bring with you. The first All-Ireland we played in was in 2009. We lost by a point to Cork. I was only 18 at the time, very much straight out of minor. Myself, Niamh McEvoy and Natalia Hyland were on the team so, we were kind of the babies of the team at the time. We were just out of minor, just having won minor and having a bit of success underage as well. We got back again in 2010, it was a great achievement. We kind of said that we didn’t appreciate how hard it was to win the final in 2010. A lot of the girls had lost in 2005 and 2004 and had spent years trying to get back, even to a final. In 2009, we lost another one. Then won in 2010. I think it was only the years in-between, when we found ourselves trying to drive the team and drive the standards to get back to the final, that we realised what a massive achievement it was. I think the next time round we made sure to relish it a little bit more. It was just one of the most special days and definitely one of the most special years that we’ve had as a team as well. I think it’s something that you’ll never forget, to achieve something like that together after the amount of heartbreak you’ve had. To be able to come back and not just wipe that slate clean but prove to yourself that you are good enough to win it and that as a team we do have the mentality to get over the line. That’s something that was really important to us and obviously really special. Ladies football, I think, has played a massive role in helping to promote women’s sport. In the last 12 months alone (we’ve seen) the fruits of that, with a massive attendance at the ladies’ final. The Irish women’s soccer team did really well this year, the Irish women’s hockey team obviously has been one of the most successful sporting teams that we’ve had without a doubt, male or female, ever. It’s enjoying a really good moment and I think that’s brilliant because I’ve always kind of said: if you can see it, you can be it. If you have younger girls looking up and seeing all these different role models in such a variety of sports, it can encourage them that they can do anything, and they can play any sport that they want. There’s a structure there and there’s a chance of success there. I think that’s massively important and I think hopefully in a few years’ time we’ll be celebrating more and more success.